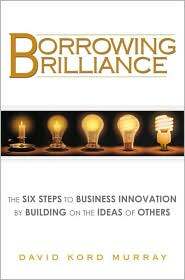 Just finished reading "Borrowing Brillance" by David Kord Murray... which I heard about when it was reviewed here in BusinessWeek. The overarching theme behind Murray's book is business ideas and where they come from... with that spot often not being one of "out of the blue" originality. That said, I found the guy himself as being almost as interesting as where the ideas come from. Murray seems quite the interesting fellow given his personal and business highs and lows described in the book. He first worked as a NASA engineer and then became an entrepreneur who was poised to sell his Lake Tahoe based financial company for $50 million, and would up with close to nothing. Through a combination of his past experience, lots of reading and a good contact made, Murray eventually found himself consulting with Intuit on the Turbo Tax direct mail program. This then led to a full time Innovation Exec role at Intuit, and then another entrepreneurial venture and now him writing this book and living back in Lake Tahoe. Solid stuff and his story seems to be an interesting example of how speed bumps can come and you may not know where you'll wind up, but you just try to keep moving forward. As stated previously, the book works with the concepts of ideas... and how to generate, repurpose and repackage them. Following up on this idea of pattern recognition and meaning making, Murray writes of how as a business society we're now out of the information age and onto the conceptual or innovation age. 1. Defining - Define the problem and figure out the right one to work on. The idea here is on of scope and how small problems can both fit within and when solved, sometimes create other ones. Murray cited Google co-founders Sergey Brin and Larry Page as good people to think of when considering problem definition. The idea behind Google began when they were Stanford PhD students, each working on a separate data mining problem. This led to thinking about organizing information, which led to search. Now that the lower level problem of search has been worked (and of course, continues to be), Google has moved back to the high level problem they talk about of organizing the world's information. Related to this idea, I also think of the information architect field and how it focuses on the presentation of data, facts and ideas... interesting stuff. 2. Borrowing - Take ideas from places near and far. This is tied to the third step, but focuses on looking for the answers to your problems from yes, your competitors, but also other fields of work entirely. Murray writes heavily about Hollywood and how the construction of movies into acts with emotional triggers and levels was something he thought about in relation to the Turbo Tax offering while at Intuit. This is in many ways the concept of critical observation... just with a wide net. 3. Combining - Throw the ideas together and try lots of different iterations. Related to borrowing, Murray writes about Star Wars and how George Lucas spend years working on it until he had the perfect combination of science fiction and mythology (with the light saber as an example). Also discussed by Murray in relation to these borrowed combinations were Google utilizing page ranks, Disneyland being built to scale like a movie set and Facebook as a metaphor of a college yearbook. Interesting concept... causes me to think about Social Networking and web publishing as done through various sources such as Facebook, blogs, Digg and Ning among others. 4. Incubating - allow the combinations to come together. This step centers on the concept of the subconscious mind being the best source of creative ideas. Murray describes historical intellects like Einstein and Newton as being in touch with their subconscious, but also provides his thoughts (in the three bullets below) on how people can train themselves to get more in touch with their subconscious. - Input: Think about what problems you want to solve. - Incubation: Work on clearing the mind... whether it be throw daily walks, meditation or simply doing creative work immediately after a good night of sleep. - Output: Be willing to let ideas in, but not be held captive by them. Sort of a duality concept of listening to ideas and emotional responses, but at the same time having doubts about them so as to not get led astray by something that is not a true belief. 5. Judging - Identify strengths and weaknesses... the throwing out of the bad parts of any idea and expanding of the best. 6. Enhancing - Eliminate the weak and enhance the strong. This sounds a lot like point five, but Murray describes it as in many ways being like a recycling of points one through five. Just continually cycle the process. The conclusion of Murray's book contains his view of "the creative life"... and how one can view these steps as being part of a creative process around more than just business. Solid stuff (with more details on Murray's book website) and it reminds me of some of the great John Gardner's writing that I linked to in this blog post.